One significant feature found in the integration of .NET Framework, Visual Studio 2005, and SQL Server 2005 is the ability to debug the CLR database objects that you create. Find out more in this chapter excerpt. One of the coolest features found in the integration of the .NET Framework, Visual Studio 2005, and SQL Server 2005 is the ability to debug the CLR database objects that you create. This tight level of integration sets SQL Server way ahead of competing database products like Oracle and DB2 that offer the ability to create stored procedures and functions using .NET code. While the other database products provide for the creation of these objects, they do not support the ability to provide integrated debugging. 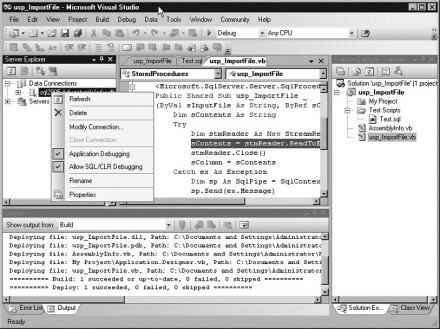 Visual Studio 2005 enables you to set breakpoints in your CLR database objects and then seamlessly step through your code and perform all of the debugging tasks that you would expects for a standard Windows or Web application, including the ability to set breakpoints, single-step through the code, inspect and change variables, and create watches—even between T-SQL and CLR code. 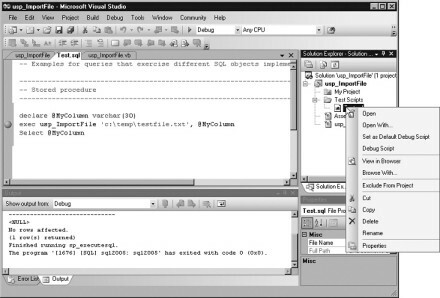 Visual Studio 2005 automatically generates test scripts that are added to your projects. You can customize and use these test scripts to execute the CLR database objects that you create. To debug a SQL Server project using Visual Studio 2005, first open the project that you want to debug and then go to the Servers window and right-click the database connection. From the pop-up menu select the option Allow SQL/CLR Debugging as is shown in Figure 3-13. Next, set up the script that you want to use to run the database object. Using the Solution window, open the Test Scripts folder and then the Test.sql file. You can set up multiple test scripts, but the Test.sql script is provided by default. If you want to change the script that Visual Studio 2005 uses to run the CLR database object, you simply right-click the desired script listed under the Test Scripts folder and select the Set As Default Debug Script option as is shown in Figure 3-14. When the test script is ready to go, use Visual Studio's Debug | Start option or simply press F5 to launch the Test.sql that will execute your CLR database object. 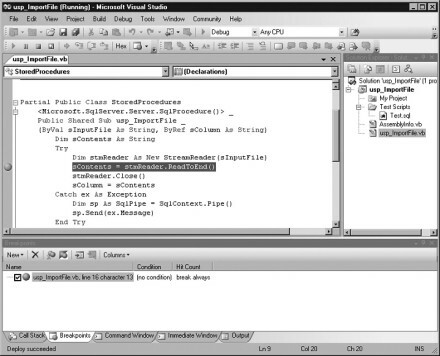 You can see an example of using the Visual Studio 2005 debugger to step through a SQL Server project in Figure 3-15. At this point you can step through the code, set new breakpoints, and change and inspect variables.